Wolverine is set to take on the daywalker, Blade, in a one-shot issue from Marvel Comics this July. Wolverine vs Blade Special #1 is written by Marc Guggenheim (X-Men Gold) with art by Dave Wilkins. What Marc Guggenheim has to say? Also Read: Is Marvel Planning A ‘Blade’ Return With Wesley Snipes? The issue’s synopsis reads, “Two of the deadliest hunters ever to have stalked the night face off! 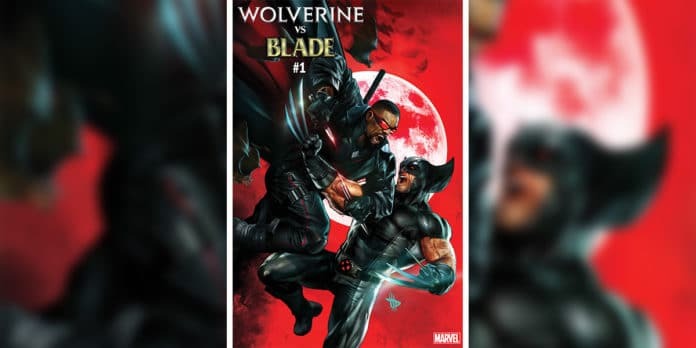 Wolverine vs Blade — ’nuffsaid!” You can see the Wilkins’ cover for the issue below. This is not the first time that Marc Guggenheim has written Wolverine. He wrote issues of the Wolverine ongoing series during the Civil War event era. Though Wolverine’s costume suggests the issue takes place sometime in the Marvel Universe’s past, both Wolverine and Blade have had major developments in the Marvel Universe in recent months. Blade became an official member of the Avengers, joining the team as they become embroiled in the Vampire Civil War. Wolverine had been dead, but returned and rejoined the X-Men. Another version of Wolverine came into the present day Marvel Universe from the future. That version of the character was involved with the recent drama around the Infinity Stones but has since returned to his own time and left present-day Logan to deal with the issue.